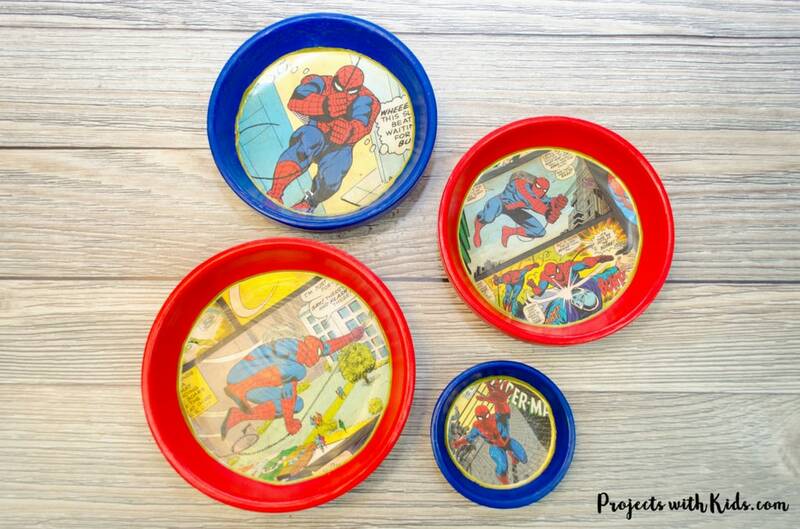 Let dad know how super he is with these awesome superhero trinket dishes Father’s Day craft and gift! 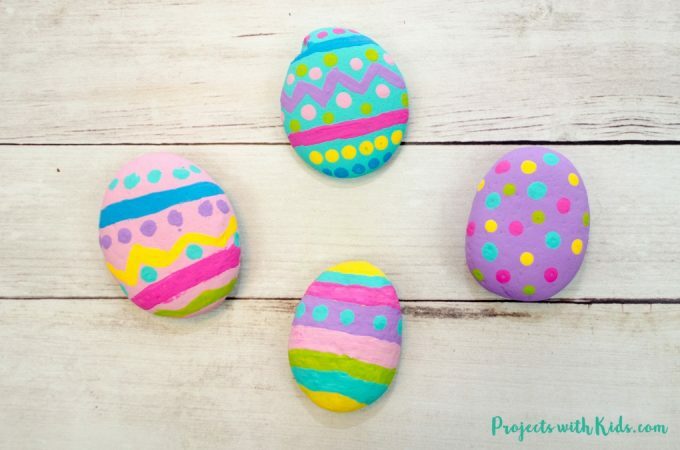 I love how these turned out, they were super easy and fun to make. 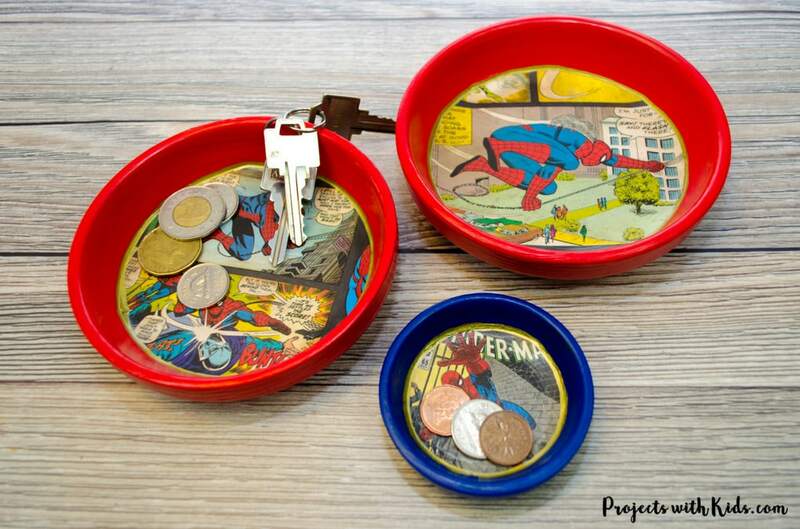 You can easily customize these with different types of superhero paper, different sizes of plant saucers and colors. We used scrapbook paper for ours because I happened to find some at our local craft store but old comic books from the thrift store or even old calendars or greeting cards would work just as well. 1. Pick out your paint colors and paint your terra cotta plant saucers. You don’t need to paint the very bottom or the part where the paper will go. We painted the top first, let it dry then turned it over and painted the sides and a bit of the bottom. 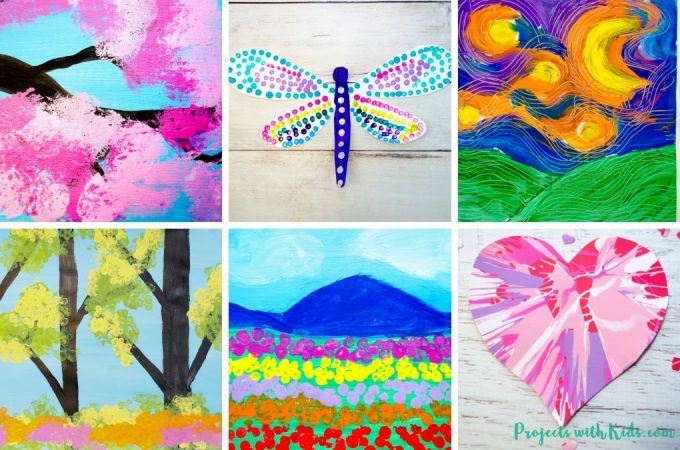 If you want the paint to dry faster, you can always use a hairdryer to speed up the drying time. Depending on the type of paint that you use and the color you might need to paint 2 coats. Let the paint completely dry before moving on. 2. 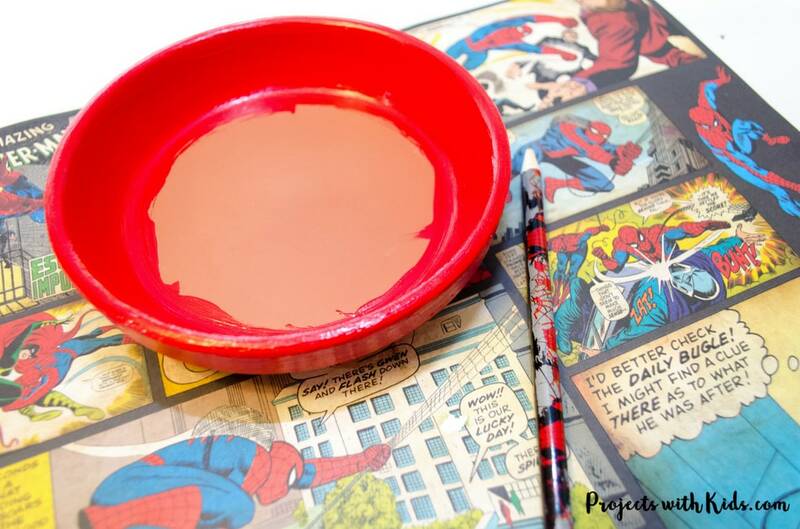 Measure out your paper to fit inside your terra cotta saucer. To make it easy, simply place the saucer on top of your paper and trace with a pencil. Cut out and trim as needed. I had to do a bit of trimming on ours to make it fit inside. 3. 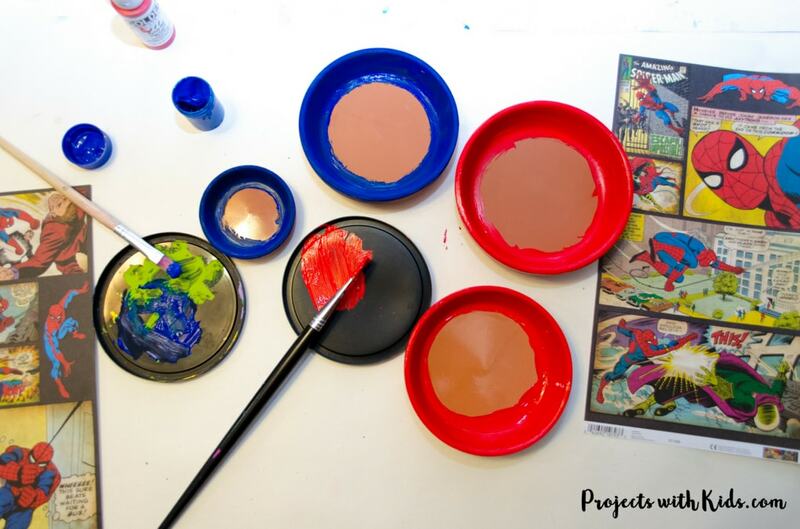 Using Mod Podge (we used a matte finish) paint the bottom of your saucer where the paper will go and put your paper down pressing firmly. Then cover your entire jewelry dish with Mod Podge to seal it. Again, this will have to be done in stages to allow for drying time. 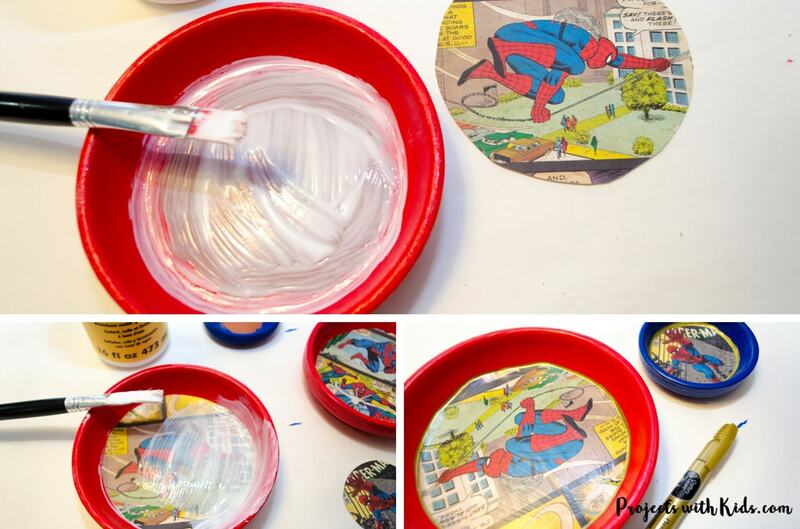 Seal the top areas first, let dry then turn the dishes over and seal the bottom areas where there is paint. I used a hairdryer to help speed up our drying time. I sometimes think my hairdryer spends more time in our craft area than in our bathroom! 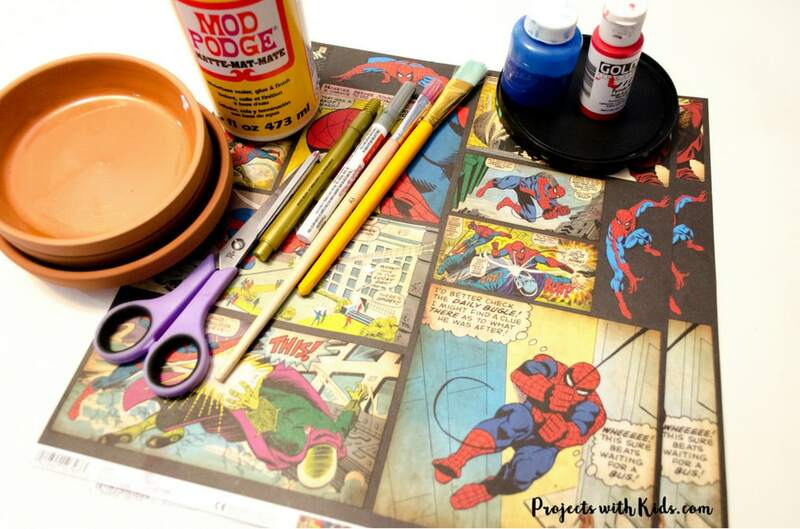 Let the Mod Podge completely dry before moving on. 4. This next step is optional, using a paint pen or sharpie draw around the edge of your paper to finish it off. We used gold for ours, but you can use any color that matches your paper. Depending on the age of the kids they may need some help with this part. Let everything dry overnight, it’s best to give the Mod Podge lots of drying time. These trinket dishes were so fun to make and I love the way they turned out! 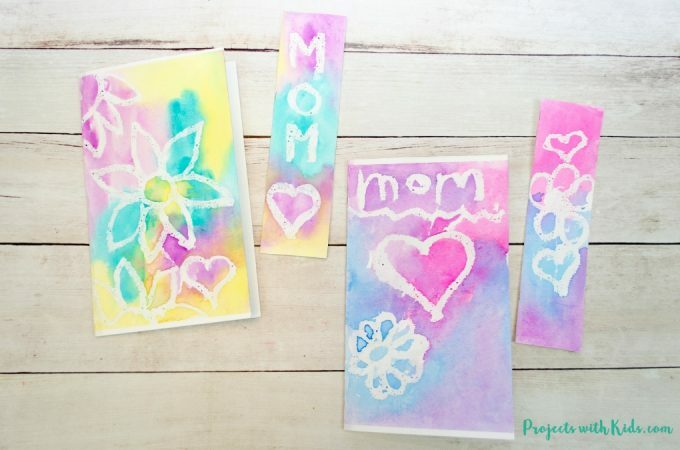 They are so simple to do and will make a wonderful Father’s Day craft and gift that kids will love to give to someone special. If you are looking for more gift ideas for dad, check out these DIY Zen Gardens that would make a perfect addition to any office area. 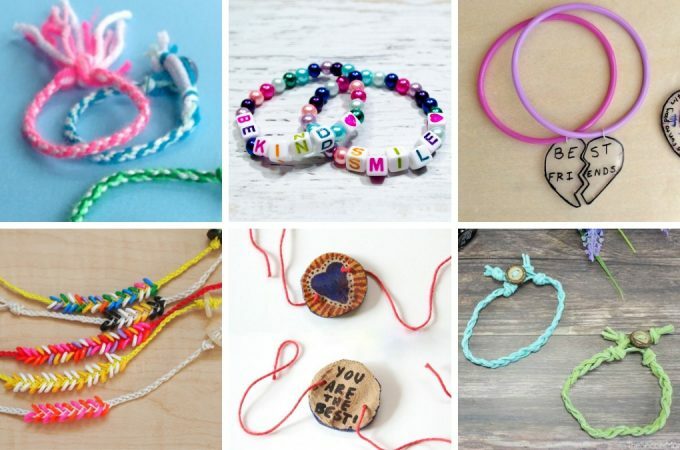 Follow my Father’s Day Pinterest board for more great craft and gift ideas.